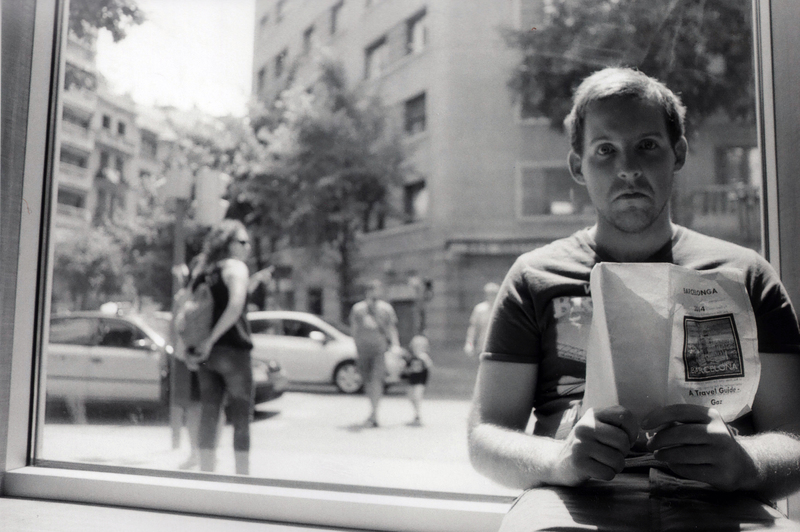 Taken in a Barcelona Hostel while waiting around, probably for someone to get ready/get their arse in gear. This was during the same trip as previous Barcelona photos, my favourite thing about this image is how it looks like it was shot for a film promotional poster (a friend of mine actually did mock this up as exactly that), but it was totally natural, I just lifted the camera and pointed it at Gareth here and this is what came out. I like how well exposed and crisply in focus he is despite sitting in a window with bright direct sunlight behind, the shadow cast over the face brings something to the image I feel. I also like how there isn’t just an empty nothingness behind the main point of focus, having a street scene behind gives a bit more to look at, the father and child crossing the road in the background and the woman standing, waiting for someone perhaps? This was taken with my Nikon FM 28mm and on Ilford HP5 ISO 400.